Line a baking sheet with nonstick paper. In a large bowl, combine Brussels sprouts, olive oil, balsamic vinegar, salt and pepper. 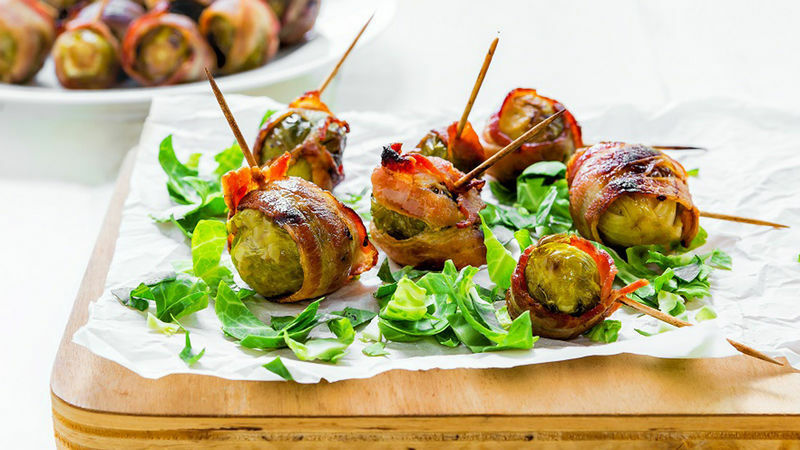 Take a Brussels Sprout and cover it with a strip of bacon. If the strip is too long, cut it and save the remainder for another Sprout. Secure the piece of bacon with a wooden toothpick. Place on lined baking tray and repeat the process with the rest of the Brussels Sprouts. Bake for 25-30 minutes until they are soft and the bacon is crispy. In my humble opinion, bacon makes everything better. And these Brussels Sprouts are no exception. Brussels Sprouts have an intense flavor that can sometimes turn bitter if not cooked properly. If you’re someone who doesn’t like Brussels sprouts, I suggest you give this recipe a try. You won’t regret it! Serve them as an appetizer for your next family gathering or get-together with friends, or as the perfect side to any main dish. Enjoy!